Time management professionals and gurus each have their own set of strategies and techniques that they recommend. We’ve found that some work better for us at WOW and we’re sharing them with you today. 1. Prioritize: A common problem people face is knowing what’s important and what’s not. 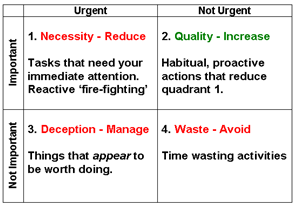 When creating your to-do list utilize the time management matrix to the right to determine which items are urgent and important and which can be de-prioritized to the bottom of the list. 2. Do Quick Things Immediately: If you have several tasks on your to-do list that each take 5 minutes, get them all done immediately. You’ll feel a great sense of accomplishment getting them off of your plate and then you can move on to the larger items. 3. Dedicated Time: If you have a project that needs a significant amount of time and attention, dedicate a specific hour (or 3) to focus on it’s completion. Turn off distractions and commit to it’s completion during this time frame. 4. Time Inventory: If you find chunks of your day frequently going missing, take a few days to note and inventory where your time is being spent, down to the minute. Following the inventory process, evaluate what areas could be used more efficiently and make the necessary changes. 5. Calendar with Buffers: If you are often late, consider building in travel time to your calendar. For example, if an appointment is from 3-4pm and it takes 20 minutes to get there, schedule the appointment on your calendar from 2:40pm-4:20pm. This way you won’t over-extend yourself before or after the obligation. 5. Block-Off Email Time: Email is one of the biggest time-consumers of our day. Instead of checking emails as they come in, schedule specific times during the day to review and respond to emails. And remember, being the person who responds immediately to emails doesn’t always mean you are the most productive. 6. Eliminate the Unnecessary: Sometimes companies and individuals schedule meetings out of routine and not necessarily out of need. Review the meetings, calls, and regular appointments in your life and decide what is adding value. If the meeting is mandatory yet adds little value to your day, consider discussing how to improve or eliminate it with your management. 7. Focus, Focus, Focus: Many people have multiple roles (entrepreneur, employee, mother, wife, etc.) that each have different responsibilities. While multi-tasking can sometimes be effective, most of the time it hurts the overall output quality in one or more areas. Instead of juggling multiple roles, commit to focusing on just one role at a time, as much as possible. What is your favorite time management trick?